When we travel the world, we come face to face with history, some grand, and some that we would wish away if we could. This article is about the great stain on European history referred to as the Holocaust. There are many recorded stories about Holocaust horrors, and you may not be familiar with this one – we weren’t – until we came across a simple, poignant memorial. We were a short walk from the famous, often photographed, Hungarian Parliament building that was inaugurated in 1896 on Hungary’s 1,000th-anniversary. If you are not familiar with this magnificent structure, you may remember it as a feature of the Viking River Cruise ads on television. 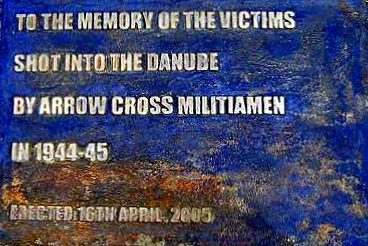 So this was a memorial, but who were the victims and who were the Arrow Cross militiamen? We didn’t know, so we did some research. Members of The Arrow Cross were Hungarian fascists sympathetic to the Nazi cause. Adolf Hitler used them to replace the legitimate government of Hungary during the Nazi occupation, ruling as the “Government of National Unity,” but in power just eight months, from October 1944 to May 1945. During that time, however, they killed or sent to concentration camps 100,000 Hungarian Jews. Because shoes are so personal. The men, women, and children to be massacred were ordered to remove their shoes, an act that we all can relate to – and therefore, easily imagine ourselves in the same terrifying situation. After they removed their shoes, the victims were summarily shot, and their dead or wounded bodies fell into the cold rushing river. Ironically, this egregious and repugnant act took place just 1,000 feet from one of man’s greatest architectural accomplishments, the beautiful Hungarian Parliament. The memorial is simply named, “Shoes on the Danube Promenade.” Like a visit to the Anne Frank House in Amsterdam, or the Auschwitz concentration camp near Krakow, Poland, a visit to the shoes in Budapest, Hungary is a moving and somber experience, and a stark reminder of the cruelty that man is capable of inflicting on his fellow human beings.